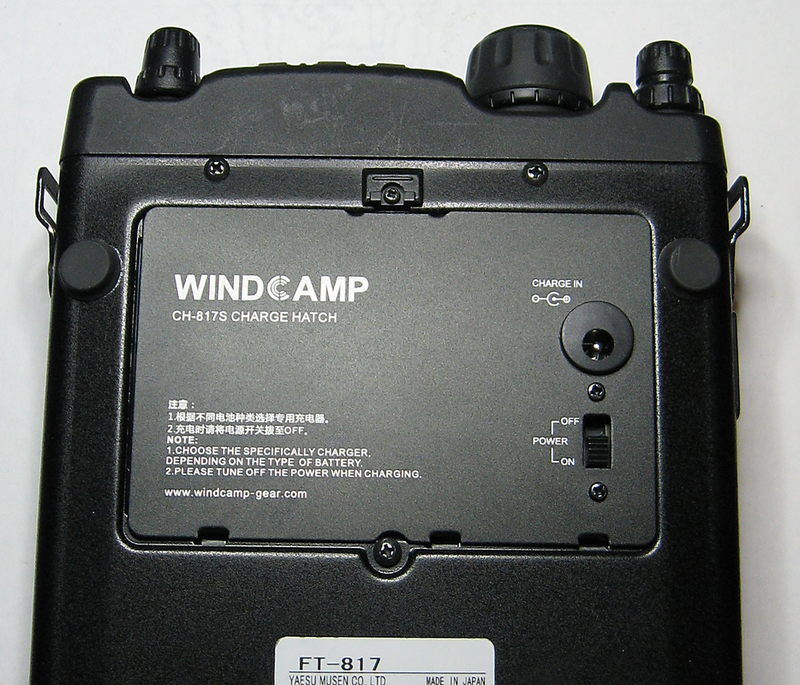 This is the 3000mah Lithium Polymer (3S) battery from WINDCAMP. It included a new battery door cover with charging port and a wall-wart charger. It doubles the battery capacity of my FT-817 compared to the original NiMH battery, but has certain limitations: according to the instructions the radio can run from either the LiPo battery or external power, but the battery switch MUST be off when external power is connected to the radio. The battery can only be charged through the charging port in the battery cover, and NEVER from the radio's built-in charging circuit. And it should be charged using only the supplied charger unit or equivalent LiPo-capable charger. 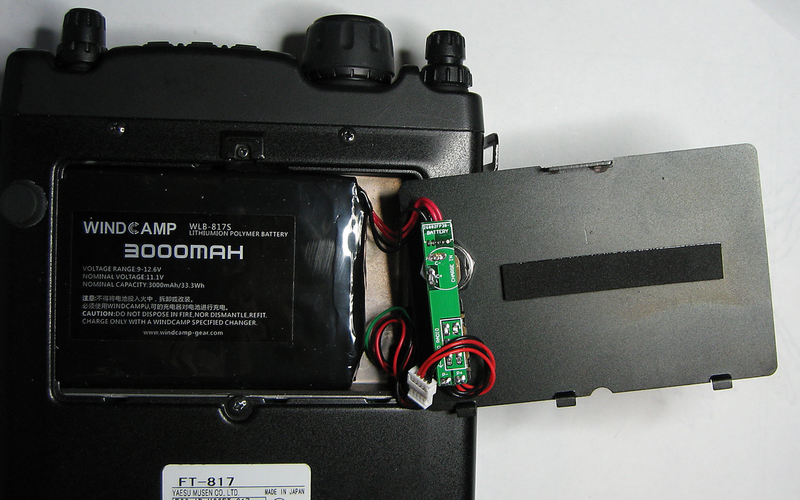 The battery and cover install in place of the NiMH battery. The new cover is aluminum and good workmanship, although the English instructions printed on it are a little "confused". 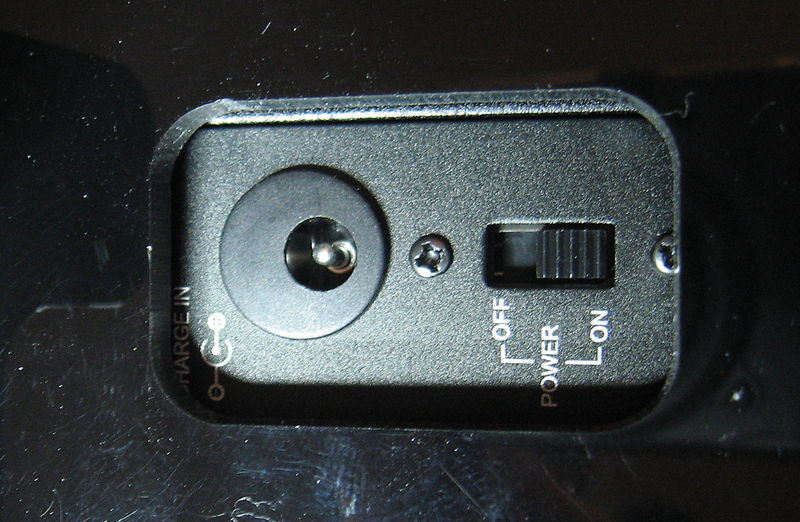 With the cover open the charging board is visible, mounted to the back. The wiring needs to be stuffed down in the space under the board and beside the battery to get the cover to snap closed. I also purchased the WINDCAMP black acrylic stand for the FT-817. 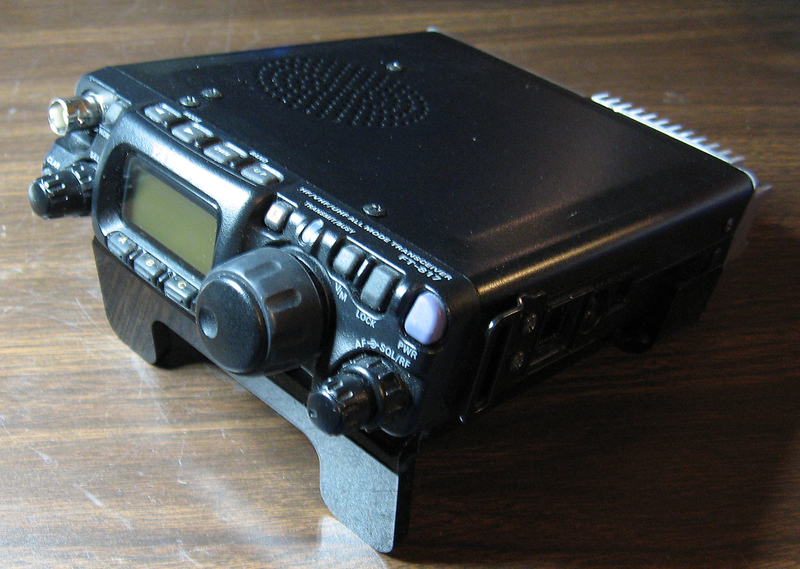 It angles the display up from the table, making the FT-817 much easier to see and operate. It's a nice quality stand and has a cutout in the base specially to access the charger port and battery switch for the LiPo battery. On the rear of the stand there is a small vertical piece of acrylic that acts as a backstop for the radio. When I added the heatsink to the rear of my FT-817 it butted against this backstop keeping the radio from sliding far enough onto the stand to allow the LiPo charger to be connected underneath. To fix the issue, I laid a small block of wood across the piece of acylic "fin" and knocked it off with a "fine adjustment tool", otherwise known as a hammer. I reglued it to the stand in the open space between the heatsink and SO-239 connector. The glue marks where the fin was originally attached are visible to the right in the photo. Now the radio slides in as originally intended. The "glue" is really a solvent that melts the acrylic pieces together. After moving the backstop the charger port and battery switch are easily accessible from the bottom of the stand.